New Delhi: Shri J P Nadda, Union Minister of Health and Family Welfare in the presence of Shri Sarbananda Sonowal, Chief Minister of Assam, inaugurated the 5th National Summit on “Good & Replicable Practices & Innovations in Public Health Care Systems in India” at Kaziranga, Assam today. Shri J P Nadda and the Chief Minister of Assam also released a Coffee Table Book on Good Practices, Evidence to Action: Towards Universal Health Coverage. Shri Ashwini Kumar Choubey, Minister of State for Health and Family Welfare, Dr Himanta Biswa Sarma, Health Minister, Govt. of Assam, Shri Piyush Hazarika, Minister of State (Health), Govt. of Assam, Smt. Preeti Sudan, Secretary (Health), Shri Manoj Jhalani, AS & MD (NHM), Shri Samir Kumar Sinha, Principal Secretary, Health & Family Welfare, Govt. of Assam were also present at the inaugural function. Speaking at the function, Chief Minister of Assam said that everybody will benefit from these best practices and there is a need to raise awareness amongst the masses about various health issues for ensuring a better future. Speaking at the function, Shri Nadda said that the government is always focused on promoting innovative approaches tailored to challenges under the most able leadership of our Hon’ble Prime Minister who has given the mantra of “Reform, Perform and Transform”. He further said that we must match speed, skill and scale to get the desired results. The Union Health Minister said that the Government believes in cooperative federalism. “The Health Ministry stands with the states. While the ownership is that of the states, we are ready to lend all technical and financial support,” he said. Shri Nadda further added that the essence of co-operative federalism lies not in decentralization alone but also in sharing and learning from each other. 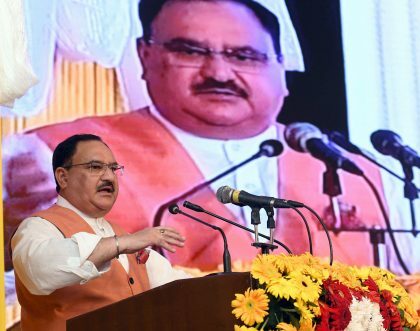 Referring to the world’s largest health insurance scheme – Ayushman Bharat-Pradhan Mantri Jan Arogya Yojana (PMJAY), Shri Nadda said that the scheme has been able to benefit around 1.5 lakh people within the first month of the launch of the programme. Shri Nadda also emphasized on the need for IT initiatives in the health sector. “They can help address gaps where we have challenges of HR, or aid accurate and quick diagnosis to improve clinical decision making particular for remote locations. National Health Mission is also supporting many IT initiatives in States,” He further said that the best practices that have been selected on m Health and digitalization will provide learnings for other states to adopt the innovations. Shri Ashwini Kumar Choubey, Minister of State for Health and Family Welfare in his speech said that many exemplary practices have been undertaken in many states to meet healthcare goals and the centre stands committed to supporting the state/UTs in their innovative endeavours. He also said that 15,000 Health and Wellness Centres across the country will start operating soon. The Health Ministry also gave away awards to the states for best performances. The award for Highest Annual Decline in Neonatal Mortality Rate 2015 vs 2016 among states was given to Himachal Pradesh – 1st (- 15.8%), Tamil Nadu 2nd (-14.3%) and Delhi-3rd (-14.3%). The award for the highest annual decline in Infant Mortality Rate was given to Kerala-1st (-16.7%), Mizoram-2nd (-15.6%) and Karnataka-3rd (-14.3%). The award for the highest annual decline in Under 5 Mortality was given Himachal Pradesh-1st (-18.2%), Assam-2nd (-16.1%) and Jharkhand, Gujarat and Kerela (-15.4%). For best performance in Family Planning awards, were given to West Bengal, Chattisgarh and Rajasthan. For best performance in RNTCP, awards were given to Andhra Pradesh, Gujarat and Arunachal Pradesh while in NLEP award was given to Gujarat in the category of State and Dadra & Nagar Haveli in the category of Union Territory. Awards for best performance in National Programme for Prevention and Control of Cancer, Diabetes, Cardiovascular Diseases and Stroke (NPCDCS) were given to Haryana and Himachal Pradesh. The award for best performing States in the category of indoor services (based on the change of IPD/1000 population from 2016-17 to 2017-18-HMIS) was given to Goa, Karnataka and Himachal Pradesh. Lakshadweep got the award among the Union Territories (UTs). For the best out-patient services, the award was given to Gujarat, Odisha and Karnataka whereas Puducherry got the award amongst the Union Territories.